To enjoy nature at its finest, you often paradoxically have to drive to get there, which means you'll have to pay for gas, contend with loading up that annoying roof rack, and be wary of animals taking Mount Hood far too literally. Doing the driving so you don't have to: Portland Singletrack Shuttle. From the good folks behind epic cycling events like Reach the Beach and Mt. 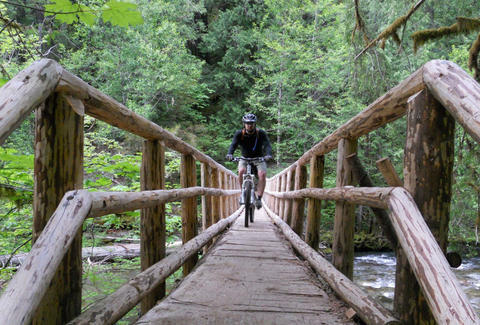 Bike Oregon, PSS's a just-launched transpo service connecting city-bound two-wheeled mud hounds with distant, knobby-friendly, trail-stitched forests, none of them Parks with powerful Friends. After scoring a ticket online, PSS'll pick you up in SE PDX and shuttle you/ your bike in a tricked-out van to trails across the region, where you'll spend the day riding with two experienced guides (one to lead the pack and one to follow) who vow "no one gets left behind", dashing the hopes of all the Louis Gossett Jr. fans in your group. Aiming to serve all levels of riders, trails'll range in difficulty from the highly technical steeps of the Gunsight/Gumjuwac Loop with its sweet views of Mt. Hood, to the Sandy Ridge Hide and Seek path built by dedicated bikers who maintain the miles of gorgeous groomed berms, bridges, and tabletop jumps, making it a perfect novice ride -- unlike Kacey Jordan, who requires an expert, or at least a ton of crack.